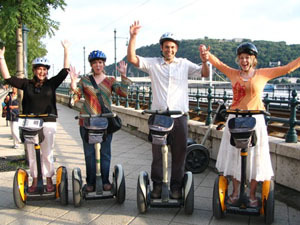 Budapest Segway tours are fun and special sightseeing tours for all ages. 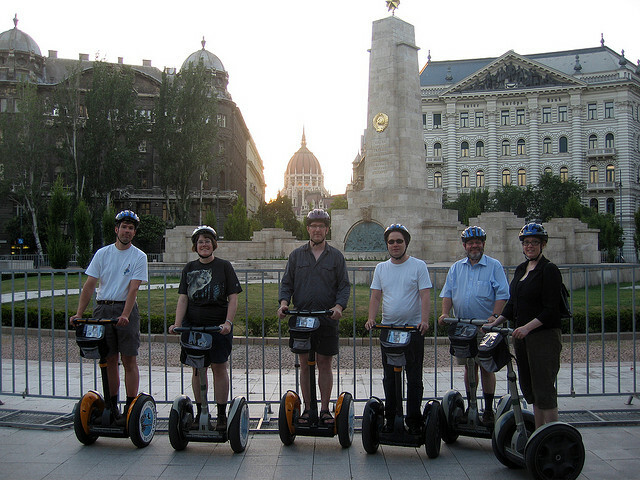 The Budapest Segway Tours are available any hour between 9 am and 6 pm. You will have a wonderful time, gliding by fascinating Budapest attractions, historical buildings, museums, parks, churches, monuments, the Danube riverside, and more. The Budapest Segway Tour offers city tour at its best, as you are completely engaged and involved! Explore the city and visit unique places on a unique human transporter. 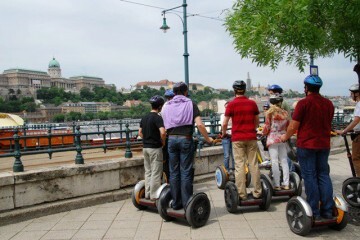 1h Segway Tours are available in the Buda Castle, in the City Center or in the City Park. 2h Mega Segway tour is available in the City Center + City Park. 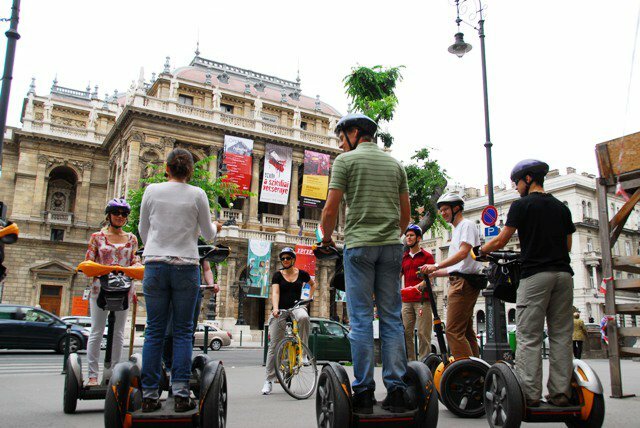 Segway tours are available almost every day, all year round in Budapest, except for some of the national holidays, like August 20, or October 23. Please check the Budapest Segway booking calendar in our booking form to see available dates for the upcoming months (some days are already fully booked in). No tours on Dec 24, 25, 26 and Jan 01 in the winter season. You can book your Budapest Segway tour in advance online. Before you make a Segway tour booking please take a look at the Budapest Segway Tour Terms and Conditions. Segway is the most amazing two wheeler electric vehicle that does not require special skills! That is why not only young people but more senior people are happy to use Segway. You need to stand on the Segway and steer it. That’s it. It is a personal transportation vehicle, so there is space for only 1 person. Self balancing has never been easier. It is not like learning to ride the bike where you are bound to fall: Segway is a breeze. We will show you how easy it is to use in the 30 minute training before the Budapest Segway tour begins. Many get it in 5 minutes, as Segway feels like steering your own body. You are in absolute control. The 30 minute is ample time to get hooked on this cool and fun vehicle invented by Dean Kamen. Segway is also environmentally friendly, so you can have a peace of mind that you are enjoying a green tour in Budapest, Hungary. 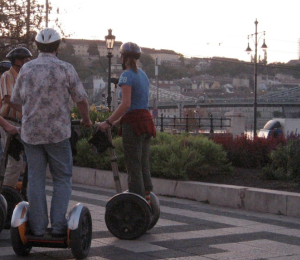 Is Segway Legal in Budapest? In Hungary, Segways can be ridden legally on certain roads and pavements. Your tour guide will guide you through historical streets and squares where Segway rides are allowed. 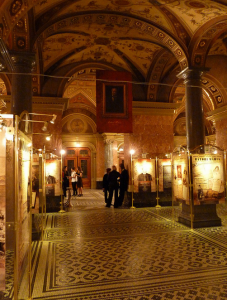 You will see beautiful attractions in Budapest. Please note that Segway tours are open air tours and there is no visit inside the attractions. What is the Segway Weight Limit? On Segways, there is a recommended minimum weight limit of 40 kg (88 lbs) and a maximum limit of 120 kg (265 lbs). We ask our tour guests to be within a reasonable range of the Segway weight limits. For this reason, no infants, toddlers, or little kids are allowed to participate in the Budapest Segway tours. What is the Segway Age Limit? On Segways, there is a recommended minimum age limit of 10 years old (with min 40 kg, 88 lbs). There is no upper limit for senior users as long as you can drive a car or ride a bike, or in general move well. You can be in your 60’s or 70’s, if you feel in good condition, there is every reason to believe that you will be a good Segway rider. Are Budapest Segway Tours in Rain Too? Are the Budapest Segway Tours cancelled if the weather is rainy? No, they are not. Segway tours can run rain or shine, as Segway wheels are not affected by the wet stones. In the tour office, we can offer you lightweight rain ponchos to protect you from the rain. 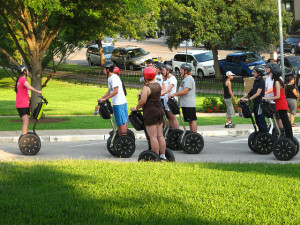 Do Segway Riders Visit Museums and Monuments? No, the Segway tour riders stay on the Segway throughout the Segway tour. We will ride around the sights and attractions, give insights about the buildings, and during the tour you can decide which museum / church / monument / cafe you wish to explore later in more depth later on, after the tour. Segway is a two wheeled vehicle, which sports high-tech gyroscopes that automatically respond to your body’s movements. We can say without exaggeration that a Segway is sensing when it should speed up and slow down based on how your balance is transmitted to the bottom platform of the Segway. When you want to start your ride, you will slightly push your breast 1-2 cm ahead, when you want to stop you need to lean your shoulders 1-2 cm back. Very very fine movements! And these are all sensed by Segway! An exhilarating feeling, it is as if you have gained special wheeled legs, you feel that Segway is part of your body. This is indeed a special sensation that is not felt on other personal vehicles like bikes, motorbikes. It is hard to put it in words until you get on one. You are guaranteed to feel comfortable by the time the Segway tour begins in Budapest! Is Segway Good For Me? If you are in an average condition, who can walk, we think you will get the hang of the Segway in a short time. But we understand if you are both concerned and excited. If you have never used a Segway before, and are not sure if you and Segway can become good friends (although we are!) you can get a few minutes test ride at the tour agency, and then decide if you want to book a Budapest Segway tour or not. 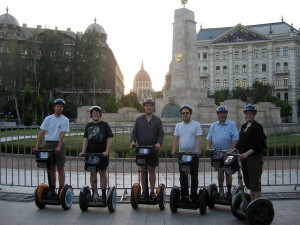 Please note that the 10% online booking discount on Budapest Segway Tours is for online reservations only. If you book the tour on the spot, you will have to pay the full tour fee (if there is availability for your planned date, which is not guaranteed in summer months). What Do I Need to Bring for the Segway Tour? Literally just yourself and your booking confirmation email. You will be provided a helmet for your head protection, and in case it rains, we have light rain ponchos for tourists. Segway tours are perfect as birthday gifts or anniversary gifts. Extraordinary, fun, unusual, beautiful, informative and a great physical experience without stretching yourself. Therefore, you can also buy the tour with a Gift Voucher for your beloved one. The Gift Voucher is valid for the given year. Please book the actual tour 4 days in advance of your planned Budapest Segway Tour. The Gift of Adventure we believe is the best to give at any age.